Public health and environmental organizations brought together by former vice president Al Gore held a pared-down meeting to replace a canceled one. A long-planned summit on climate change and health that was abruptly canceled last month by the Centers for Disease Control and Prevention (CDC) got a second chance at life in Atlanta yesterday. Detached from the federal agency and cut to a third of its originally intended length, the resurrected conference likely earned much more attention than it otherwise would have. The renamed Climate and Health Meeting took place a few kilometers from the CDC at the Carter Center, a nonprofit organization founded by former president Jimmy Carter, thanks to a rescue mission by former vice president Al Gore, who was scheduled to be one of the original meeting’s keynote speakers. The CDC canceled the original conference just as President Donald Trump’s new administration—known to be hostile to the idea that human activity is causing climate change—took office. When the decision became public, Gore mobilized the nonprofit he founded, the Climate Reality Project, along with a slate of other climate-concerned organizations. The revived 1-day meeting retained the basic objective of the 3-day original—to examine ways in which altered climatic conditions impinge on human health or are expected to do so—but not the original’s broad slate of abstracts about specific effects of climate change on pathogens, chronic health conditions, public safety, and food. Protecting vulnerable groups is a core public health concern that speakers addressed. 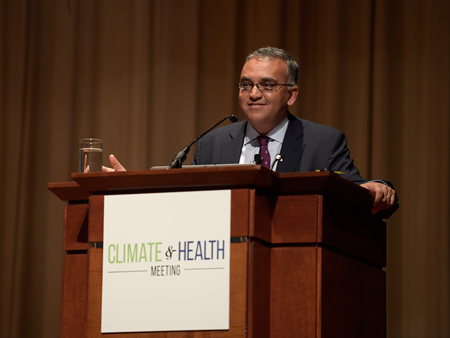 In a rapid succession of presentations later, speakers and panelists reviewed familiar observations and predictions of climate scientists through the less familiar lens of likely health impacts. Presenters discussed rising temperatures that encourage mosquito-borne diseases such as Zika, greater flooding that increases the dispersal of waterborne pathogens such as cholera, plant diseases that attenuate the nutrients in major crops, and extreme weather events that destabilize societies. Because the original 3-day meeting was collapsed into 1 day, additional meetings are planned. The Harvard Global Health Institute will hold a Symposium on Climate Change and Public Health on 27 April. Benjamin said that APHA’s annual meeting, which will bring 12,000 attendees to Atlanta in November, may host some of the canceled sessions as well. Although two CDC scientists appeared at the meeting on Thursday, one speaking on a panel and one introducing a keynote address, it’s unclear if federal scientists will come to the future gatherings, said Jonathan Patz, director of the Global Health Institute of the University of Wisconsin–Madison. Citation: McKenna, M. (2017), Revived climate change forum focuses on threats to human health, Eos, 98, https://doi.org/10.1029/2017EO068177. Published on 17 February 2017.